The Hindu Goddess Lakshmi is the Goddess of light and abundance. Abundance not only of material wealth and prosperity but also spiritual knowledge and wisdom. It is believed that anyone who approaches Lakshmi sincerely and without greed for personal wealth advancement will be blessed with good fortune and success. Lakshmi is one of the Mother Goddesses, She represents the creative, feminine aspect of the divine. In this role she is addressed as Mata. Lakshmi is also the Goddess of light and is celebrated at Diwali, known as the festival of light. Meaning of the name Lakshmi: Lakshmi is derived from the Sanskrit word “laksya” meaning aim or goal as she represents what human beings should be striving for. Her name can also be spelt Laksmi and Laxmi. Genealogy: In Hindu mythology, like the Greek Goddess Aphrodite she was born out of the churning of the seas. The Hindu Goddess Lakshmi is depicted with beautiful eyes and a golden complexion, wearing sumptuous robes of red and gold. She has four arms suggesting her dominion over the four directions. From the lowest hand golden coins fall, representing wealth and luxury that she dispenses to all who worship her without greed, according to their dharma. Sacred Plant: She is often depicted on a seated on a lotus flower, holding lotus buds in her upper pair of limbs. Sacred Animal: Elephants accompany this Goddess, anointing her with water. She is also shown riding a white owl, reminding us not to seek prosperity out of selfish desires but to keep our eyes open for opportunities for spiritual enlightenment. Festivals: The main festivals are Diwali and Kojagari when special Pujas are performed in her honour. Ideally this should be repeated 108 times for 40 days for maximum benefit. The easiest way is to use mala beads so you can keep count. Any repetitions will encourage her assistance, especially if chanted on a Friday. 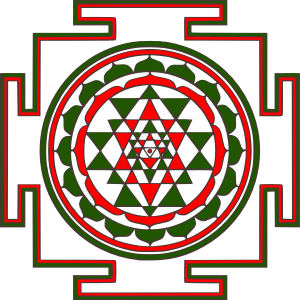 In addition to sacred words, there is also a symbol that represents the energies of this Goddess known as the Shri Yantra. By meditating on this symbol you can also gain Lakshmi’s blessings. The Mother: The Mother Archetype is a life-giver and the source of nurturing, devotion, patience and unconditional love. The ability to forgive and provide for her children and put them before herself is the essence of a good mother. In its shadow aspect the Mother can be devouring, abusive and abandoning. The shadow Mother can also make her children feel guilty about becoming independent and leaving her. The Hindu Goddess Lakshmi is referred to as Mata, the Mother, all the world is born through her energy. She is also a great provider, bestowing spiritual and material wealth. The Mother: It is not necessary to be a biological mother to have this Archetype. It can refer to anyone who has a lifelong pattern of nurturing and devotion to living things. You are exhibiting the features of the shadow Mother if you smother your children and are over protective. Encourage independence and allow children to make mistakes but be available to give care and advice when it's needed. The other shadow Mother is the one that abandons her children, or is so busy that she has no time for nurturing her young.